This Let's Dance layout was created by design team member Ginger! "All my children are grown, but I was given this paper on Prom. When I noticed the beautiful pink/purple glitter paper I knew I had to do photos of my oldest daughter's prom which was taken in 1991!! She did not want the normal long dress so we had this dress designed and created with all the details that Heather requested. The lady even made a trip to California to get her shoes and earrings. The photo on the right is her date Chris arriving and the middle photo is Heather pinning on him his flower at our home in Arlington, Texas. The photo on the left was taken at their prom. They both had a great time together and many fond memories." Please stop by The Crafty Scrapper soon to pick up papers to scrap your Prom memories! This travel layout was done as a design team project for my favorite scrapbook store, THE CRAFTY SCRAPPER, in Waxahachie, Texas. While on our twentieth anniversary trip to London and Scottland, my husband and I became lost, somewhere close to The Strand in London. We tried on our own to find our way using maps, but to no avail. Mind you, this was before the day of GPS and smart phones. Finally, we saw a "Bobby" and asked for help, which he gave and we were so grateful to receive! The best part of being lost was finding the Royal Courts of Justice, Twinings Tea Museum and the Australian High Commission building. 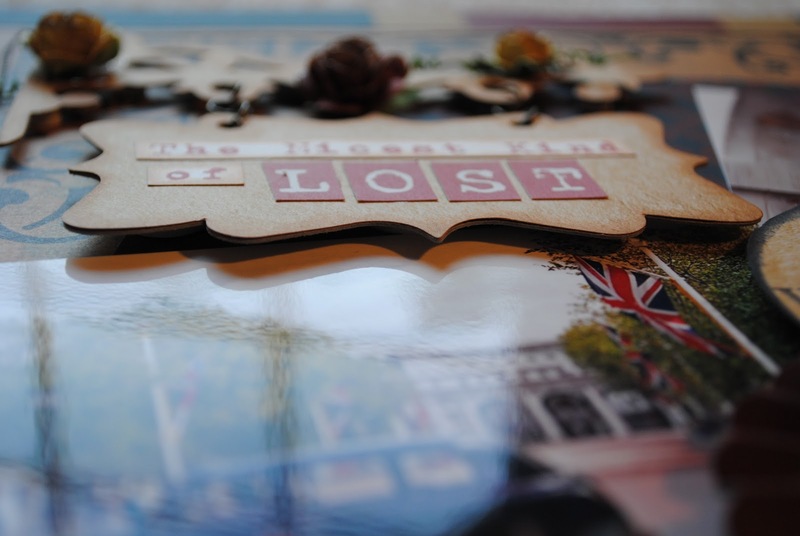 We had such a nice time being lost! Techniques used on this layout were stitching, inking, distressing, die cutting, stamping and 3-D work. All Products can be purchased at The Crafty Scrapper! Please stop by The Crafty Scrapper to see this gorgeous layout, and to pick up some travel papers for your scrapbooking! This Graduation layout was created by design team member Ginger! I did this layout for the design team of The Crafty Scrapper. They gave me such beautiful papers to use. I have four children so I had to use each of their photos on this layout. I used Bazzill black cardstock and then added Reminisce paper The Graduate which I cut out the inside because it was plain gold. I then added Reminisce paper We did it paper. They gave be part of a white zipper which I was determined to make a rose from it. It rather turned out easy and I am looking forward to making another one on another layout! I hope you like this layout and please go to www.thecraftyscrapper.com. 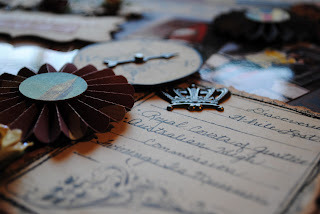 Today I want to show you a project I did for my local scrapbook store, The Crafty Scrapper. I am so fortunate to be on their design team. This store is cutting edge in every way. Now that being said, I have to say that I am NOT cutting edge. I am a very clean and simple scrapbooker. I LOVE the look of all the flowers and trinkets and the vintage ephemera. And I can copy it with the best of them. But when I sit down to make a project, my brain thinks SIMPLE and CLEAN. 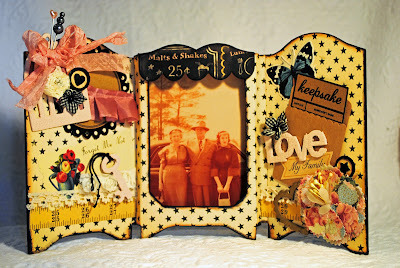 The owner of The Crafty Scrapper had made one of these inset wooden frames and even taught it as a class - very vintage. Totally beautiful. But when I was presented with these papers from Bo-Bunny, I saw bright and clean. So that's how this came about. I would also love for you to find The Crafty Scrapper on Facebook. You will be so glad you did! 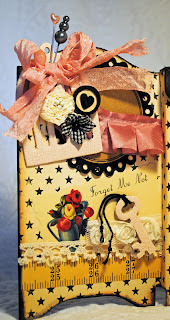 Be sure to check out this gorgeous frame at the register at The Crafty Scrapper, and pick up a frame for yourself too!! As the new products continue to come into The Crafty Scrapper the design team is busy putting together inspiring layouts and designs for everyone to check out. Jennifer created these fun New York City travel layouts using new papers from Reminisce's Travelogue line. Check them out below. This is what Jennifer has to say about her layouts "I haven't been to New York yet, but I knew I could count on my world traveling neighbor since she's been twice. I used my silhouette cameo to cut the New York title and the circles on the second page. 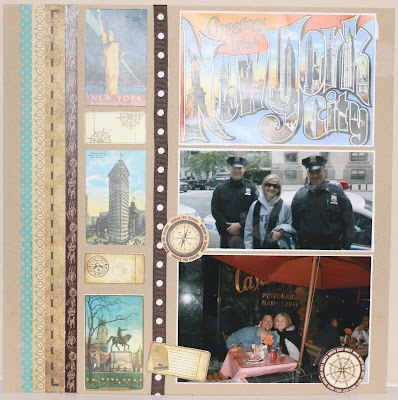 The products I used from this line are: Travelogue die cut stickers, Expedition Destination die cut stickers, Paper: Travelogue- journey of a thousand miles, longitude, new york. 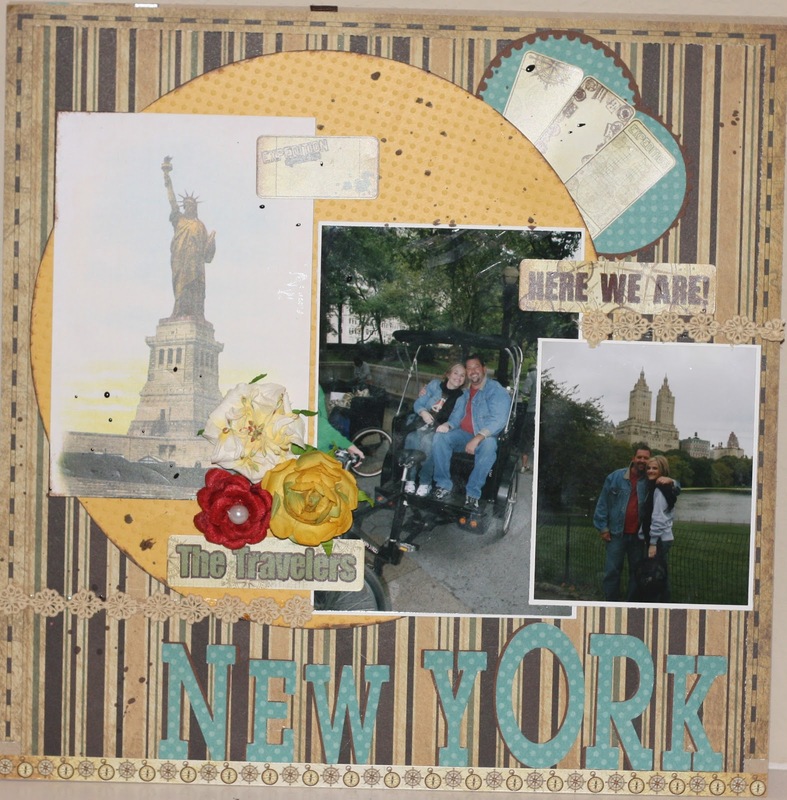 If you have travel pictures to scrap make sure you check out the travel section at The Crafty Scrapper, they always have a great selection for different destinations." 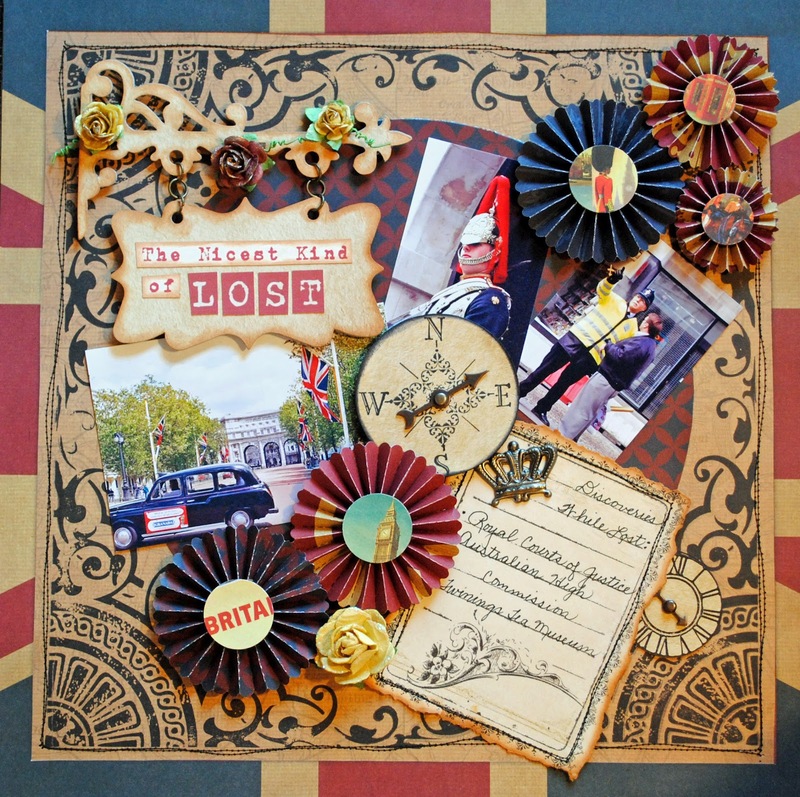 Be sure to check out this layout at The Crafty Scrapper, and pick up some papers to scrap your traveling memories! We all had a great time but we were missing our son Ryan and his wife Tiffany. They just had a baby girl and were unable to join us on this trip. At last we landed in Colorado, rented two SUV'S and our first stop was the Continental Divide! It was so beautiful and we all quickly put on our jackets for it was getting alot cooler. This photo is some of our children! We went to the Royal Gorge and it was completely spectacular!! It was also a very hot day so we were moving rather slowly. The bridge was so gorgeous and the views were amazing. We were there nearly all day. We did take a train down to the river below and watched rafters go by. We also found a great little spot for a picnic! This is Winter Park where we stayed. It was so beautiful there! At the park there were so many gorgeous flowers blooming and so many things for us to do. We played miniature golf, road down a slope on their sleds, etc. The photo on the right we took a ski lift to the top where there was a beautiful log resort at the top where you can eat, etc. The other photo is the view below which is spectacular! The Rocky Mountains are so beautiful to see! This was my most favorite part of the trip. Every where you looked you saw something so amazing! I now know why John Denver wrote the song Rocky Mountain High! Here are more photos of us at The Rocky Mountains. While we were at the top we saw a lot of elk. We went to the Garden of the Gods. There are so many unusual and large rock formation to see! Aaah! Pikes Peak! This was a wonderful trip to the top. It was cloudy that day and a bit cool but we boarded the train to ride to the top. The higher we got the colder it became. This is our trip to The Seven Falls. It was a beautiful adventure for us all. Well, here we are at the end of our trip! We all had a great time but we were all very tired and was waiting to board our flight back home. The photo on the left is my grandson Logan at the top of Pikes Peak! All supplies are from The Crafty Scrapper. Stop by the register to see this amazing mini album! 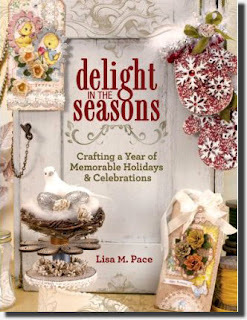 The Crafty Scrapper is hosting a creative weekend and book signing with Lisa Pace THIS Friday and Saturday, February 24th-25th! Friday evening will start off with a FREE make-n-take using Lisa's NEW stamp release The Antiquated Collection so be sure to come early! We will be having an all night crop 5 to midnight so stay and play. Space is limited; make sure you call to reserve your spot. You can purchase a copy of Lisa's NEW book. We have all Lisa's new stamps in stock. She will be using them in both classes Saturday and Friday nights make-n-take. 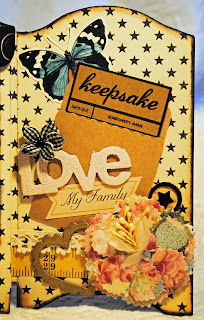 "As most of you know, I love all things vintage and vintage samplers are high on my list. I created this canvas as a tribute to all those I’ve come across. In this class you will create an 8” x 10” vintage style sampler using stamps from my new Antiquated Collection stamp line and accent your canvas using several different Maya Road embellishments. Once completed you can either frame your sampler or set it on an easel. This will be left for you to decide. Please Note: The resin flower colors may be substituted for another depending on availability. The wooden butterfly, birds and wings will vary in style." "In this class, I will show you how to alter two vintage jello molds using paint, glitter, tinsel, muslin, burlap and the Perfumery stamp set from my Antiquated Collection stamp line. Both molds are accented using Maya Road embellishments and trims. Once completed these altered home décor pieces will look adorable placed on any shelf, coffee table or end table." Spaces are limited, call the store to sign up 972-923-3151. If you sign up for both classes you will receive a box lunch from Doves Nest. Class attendees also receive 10% off their purchases. If you need the items on the supply list, Lisa's books and/or the Antiquated stamps call ahead to the store and we will hold them. This is going to be an amazing and fun-filled weekend. We can't wait to see you there!! 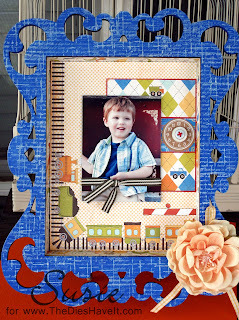 Jennifer shares another awesome example of what you can do with The Crafty Scrapper's new Diecut Kits! Jennifer says "I wasn't quite sure what I wanted to do with this frame, but I had the new Pebbles line With Love and I really wanted to use it. 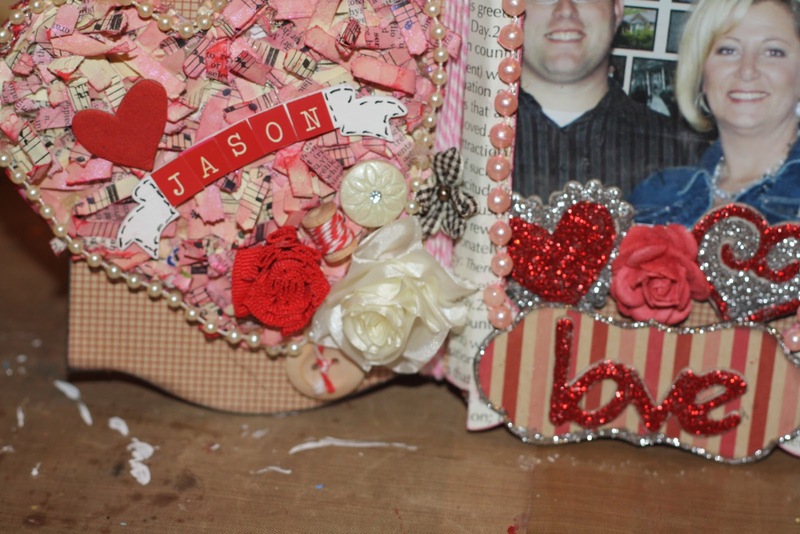 I created a Valentine's frame using a lot of Maya Road chipboard and embellishments." 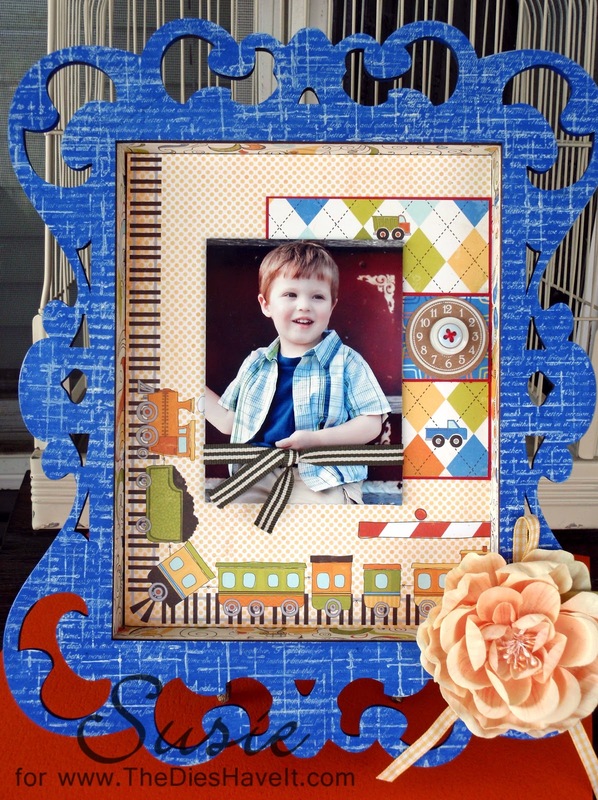 Be sure to check out this frame in the design case at The Crafty Scrapper, and pick up a Diecut Kit for yourself! Here's another GORGEOUS sample of what you can do with our new diecut kits at The Crafty Scrapper by design team member Patty. Wouldn't this be a perfect gift for a family member? 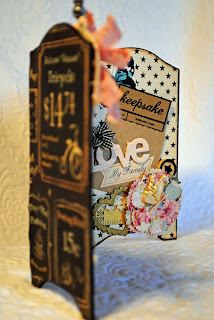 Even the back of this little frame is covered on the back with pretty paper! Here are some more pictures of the girls having fun at CHA! The Crafty Scrapper has all the new Maya Road, and My Mind's Eye in stock! Hope to see you shopping this week. We will post more pictures from CHA soon! "I decided to do layouts of my parents. The middle photo is shortly after they were married in 1949. The other two are individual photos of them. My Dad has passed away and my Mom is 80. I knew that these photos would be perfect for the paper that I chose. I love this vintage feel. I added the paper very carefully and then painted parts of the paper with white paint. 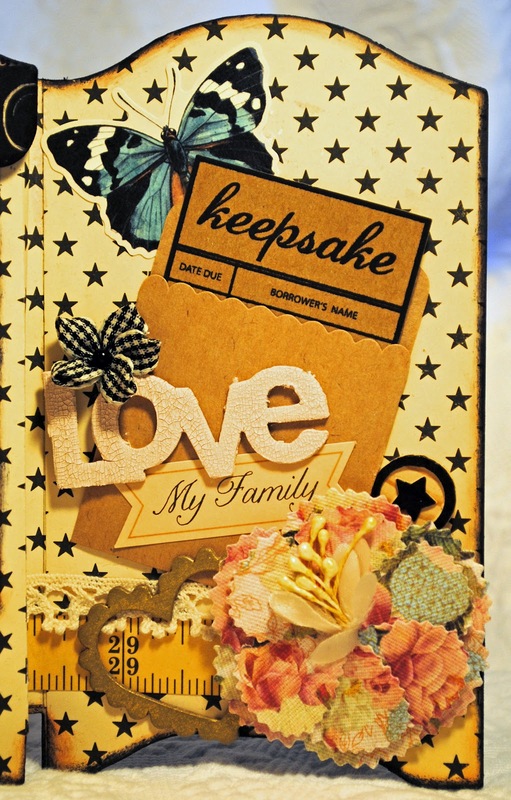 I added Tim Holtz hinges which I painted as well. I used Prima flowers to accent the middle photo along with a little bird and Maya Roads stick pins. At the top of also added another little bird and flowers. This is the back of the frame which I decided it needed to be decorated as well to make it all fit together. On the left I added a silver heart and placed a capital S which Storey is our family name. On the middle I placed Mom and Dad 1949. On the right I added a beautiful antique button and tied ribbons around it with a letter F for family!" Be sure to stop in at The Crafty Scrapper to see this frame in the front case, and to purchase a kit for yourself! It's been a few weeks since the ladies made it back from Winter 2012 CHA, and the products are starting to roll in! 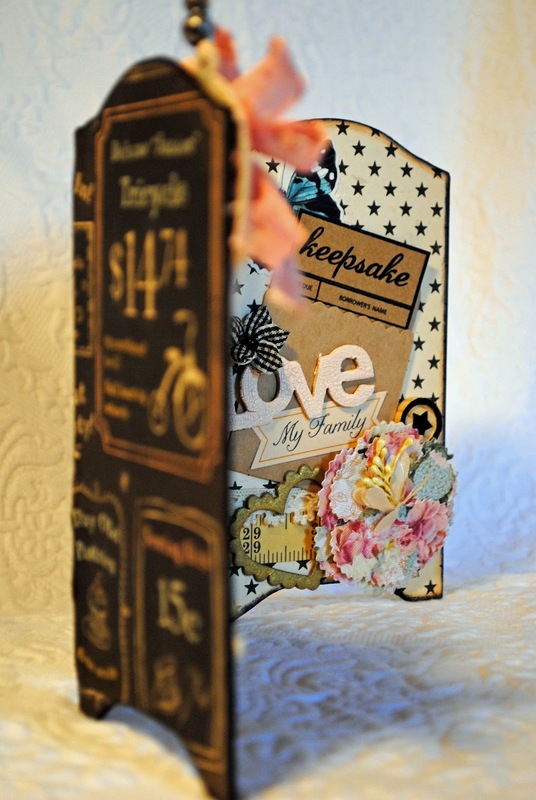 Yesterday new products from Stampers Anonymous, Dylusion, Wendy Vecchi (including her new book) arrived on the shelves. We hope to see you at The Crafty Scrapper soon. In the meantime, enjoy some pictures from our recent trip to CHA in California. I heard the girls were just as excited about the palm trees as the show. The crates with everyone's products waiting to be unpacked. The inspiring decorations started early. The ladies took some classes to see what new products we should get in at The Crafty Scrapper. We'll be back tomorrow with more pictures to share from our adventures at CHA, and to update on MORE new product arriving at the store!